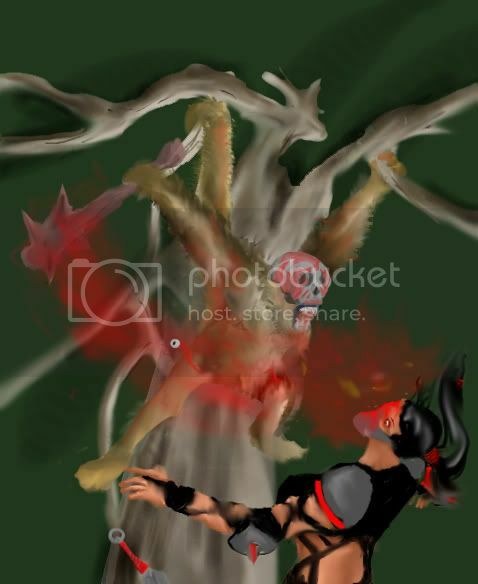 A- you are hidden in the woods as you oponent aproaches you drop from a branch swinging a club. Last edited by Digital_Blacksmith; February 5th, 2008 at 06:07 PM. "The Adventures of Furious Jorge!" "Furious Jorge, as the locals called him, was a monkey who lived happily in the jungle with his other monkey friends. But one day, humans started showing up, harming Jorge's home and friends. Jorge did not like this one bit, and got angry. He set out to kill every human that entered his domain. This is what happened to the unfortunate ninja woman, who had half of her face ripped off by Furious Jorge's stick." Ok....I guess I win on default? I PMed Cookiedough, and never got a reply after the couple of PMs about the duel itself. Its the 7th here as well, and I posted that at 9am here, what time is it over there? you had me worried for a bit. A - and produce throwing blades as they fly through the air the figure didnt even know what hit him. And that is why I chose you. I love that simplistic style you do. So, we going to be voted on soon? Thanks a lot for the votes and the help, chaos. Digital Blacksmith: i had fun doing this, thanks for the challenge. Not a problem. Thanks for the fight.